Expand your decorating options without exceeding your budget or sacrificing quality with laminate flooring. With its variety of eye-catching designs and colors, our laminate collection features a smart balance of durability, style, and value for any home. Whether you prefer our laminate wood flooring or laminate tile flooring options, we offer the experience and craftsmanship to make your new flooring project a success. Enjoy the luxurious look and feel of hardwood at a fraction of the cost when you upgrade your home with our laminate wood flooring. As one of our most affordable options, laminates have become a fast favorite for their ability to mimic the appearance of natural hardwoods while saving homeowners hundreds—or even thousands—of dollars on materials and installation. Though price alone is an advantage, laminate offers lasting durability and a defect-free installation. Laminate's hard-wearing, synthetic surface is nearly impervious to dents and scratches. Though no hardwood or laminate is impervious standing water, laminate's construction makes it better suited for areas with higher humidity and moisture. Because its production is uniform, you won’t find irregular or imperfect pieces that must be discarded. Best of all, laminate can be installed the same day it arrives, without requiring multiple days of acclimation to your home. Add the elegance of tile to your home with less expense and effort when you select any of our laminate tile flooring designs. With a full array of colors and patterns, our laminate offers an alternative to traditional tile that produces a stunning effect in your home—while going easy on your wallet. In addition to its attractive appearance, laminate tile installs quickly. Each plank of laminate is the equivalent of multiple tiles and installs easily over existing flooring, which means your handsome new laminate tile floor can be installed in an afternoon and serve you well for many years to come. Whether you prefer traditional, modern, or contemporary styles, we offer a virtually limitless collection of laminate floors. 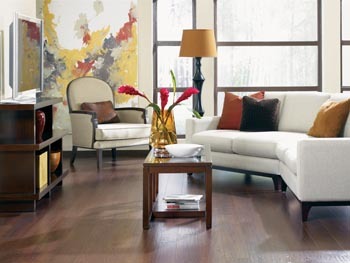 In order to ensure we remain current with industry innovations, our flooring lines are updated every season. By keeping our inventory up to date, we assure you will have a diverse selection of the latest in laminate designs, from new twists on enduring and timeless patterns, to popular trends for modern homes. Once you've settled on the new flooring material and design that best fit your needs, allow our laminate flooring installation professionals to complete your project. Our reliable and knowledgeable staff arrives at your home to complete your installation, ensuring your new floor is installed properly the first time. For your complete satisfaction, we offer a lifetime installation guarantee. If you experience any issues with our work, simply let us know, and we will return to resolve them at no additional cost. Contact us today in Little Rock, Arkansas, and allow our helpful laminate flooring professionals to design and install your lovely new floor.